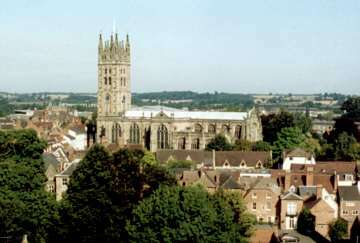 The town of Warwick is situated near the centre of England, 8 miles from Stratford-upon-Avon. 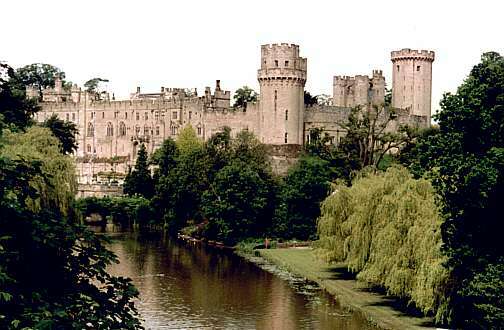 Warwick Castle is the finest mediaeval castle in England, and is one of the most popular tourist destinations in the United Kingdom. This page describes the history of Warwick Castle, and includes many photos of the castle. 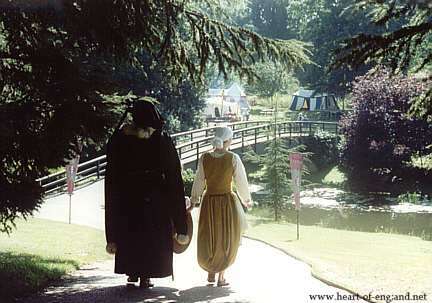 Special events (living history) are held daily on most weekends throughout the Summer. Jousting Tournaments which are held at Warwick Castle, usually on Bank Holiday weekends and daily during high Summer. The current calendar of events is at Events Program on the official website. 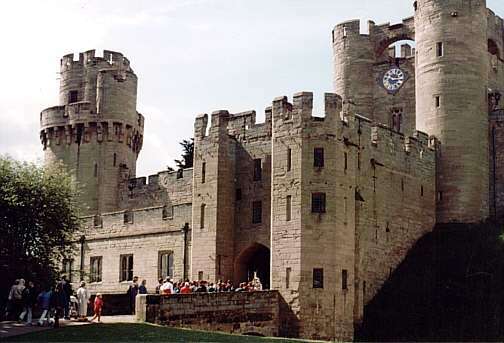 Warwick Castle featured in 10 half-hour TV programs, which gave viewers an insight into some of the many activities which take place at Warwick Castle. More details and more pictures from the program on the page Behind the Scenes at Warwick Castle. 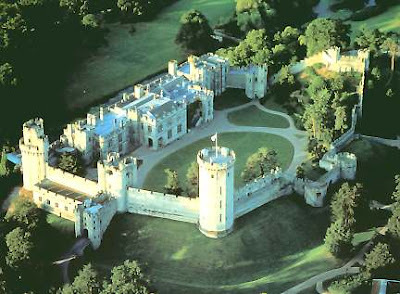 This aerial view of the castle shows the major features of the castle as it is today. The wall running along the foreground of the picture has at its extreme left corner Caesar's Tower, in the centre is the Gatehouse, and at the right corner, near the centre of the picture, is Guy's tower. Enclosed behind this wall is the castle courtyard, and to the rear of the courtyard is the apartment block. At the extreme top right of the picture is the raised mound, now planted with shrubbery, which was the site of the original wooden castle. The river Avon runs behind the apartment block. The knight on horseback and the aerial view of the castle, both above, are both taken from a Warwick Castle Calendar. All other photos are my own. This is the first view that visitors get of the East Front of the castle, which is the main entrance. The pathway leads round to the castle Gatehouse. At the left is Caesar's Tower, and in the centre is the Gatehouse. Between 1748 and 1752, the then Earl of Warwick commissioned 5 paintings of the castle by the Italian painter Canaletto. The entrance into the castle is through a passage carved in the solid rock, guarded by two portcullises, shown in the picture at the right. This arrangement is designed to trap intruders between the gates. This view shows the East Front as seen from within the castle courtyard. 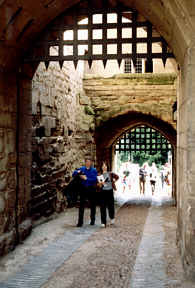 The entrance into the courtyard, through the portcullis, is visible at the far right. At the left is Guy's Tower. Some idea of the height of the tower (128 feet) can be judged from the scale of the people at its base. Guy's Tower was named after Guy of Warwick, a legendary Anglo-Saxon mystic warrior. 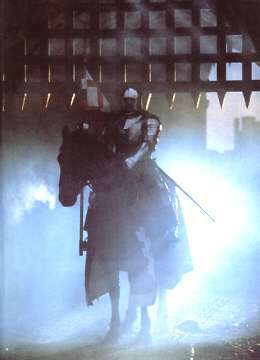 There is a reference to his story in Chaucer's Canterbury Tales. A narrow spiral staircase, which visitors can climb, ascends to the top of Guy's Tower. This affords views over a large area of Warwickshire. 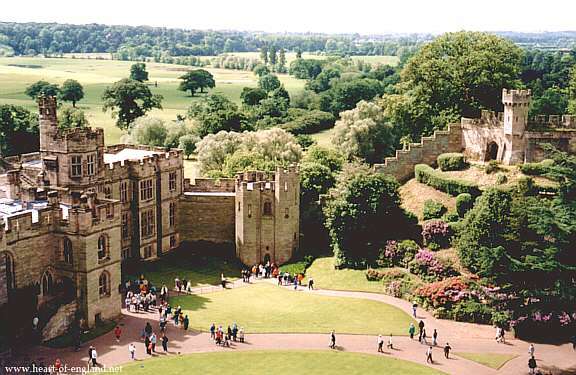 The picture below shows the view looking inwards across the castle courtyard from the top of Guy's Tower. At the left are the apartment buildings, and at the right is the castle mound, which was the site of the original castle. In the background is the Warwickshire countryside. The view above is looking towards Stratford-on-Avon, which lies about 8 miles away in that direction. There is also a good view from the top of the castle mound, which is easier to ascend. The image below is a 360-degree panorama showing the view all around from Guy's Tower. At the far left is the entrance path upto the Gatehouse, then Caesar's Tower, and the apartment block. The centre of the picture looks over the courtyard towards Stratford as in the view above. 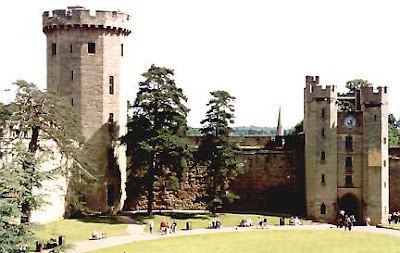 Then further round is the North wall of the castle, and beyond that the view out over the town of Warwick. The large church is St Mary's, described and pictured further down this page. The large white rectangular building around a courtyard in front of St Mary's was the castle stables, and is now the visitors' entrance, gift shop and restaurant. A path leads out of the right side of the entrance block, behind the trees at the far right, and this is the same path shown at the far left of the picture. You can click on the image above to see a wider version of that panorama. This view shows the South Front of the apartment block which overlooks the Avon. 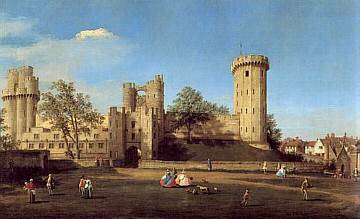 This is the classic view of Warwick Castle. 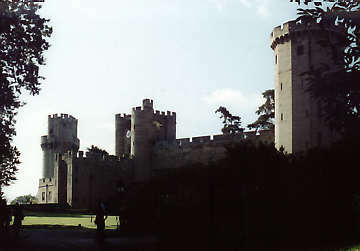 To the right side of the picture is the East Front, consisting of Caesar's Tower, the towers of the Gatehouse, and Guy's Tower. The photo at the right is taken from a bridge on the Warwick-Banbury road which crosses the Avon just upstream from the castle. 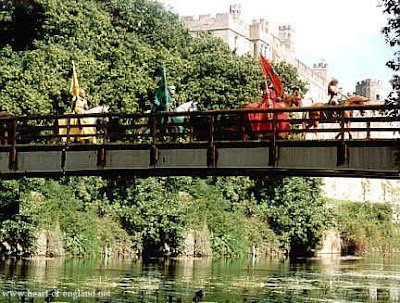 The main road originally crossed the Avon at a medieval bridge nearer the castle. The present bridge was built in 1790. The diversion of the road to use the present route was part of an ambitious landscaping plan for the castle designed by Lancelot "Capability" Brown. The picture at the left shows part of the South Front as viewed from an island in the Avon river. 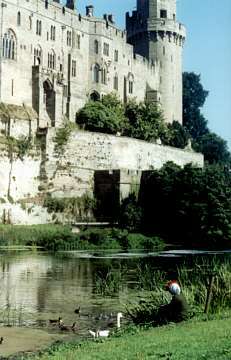 The island is reached from a bridge within the castle grounds. The island is used as a location for some live events at the castle. 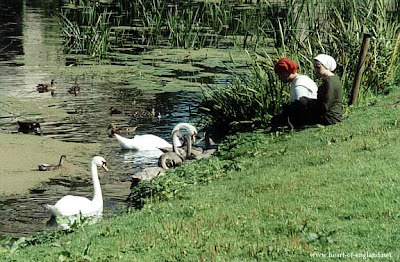 In this picture some children sitting on the bank are feeding swans, and their cygnets. The apartment block includes the Chapel, Great Hall, State Rooms, and Apartments. 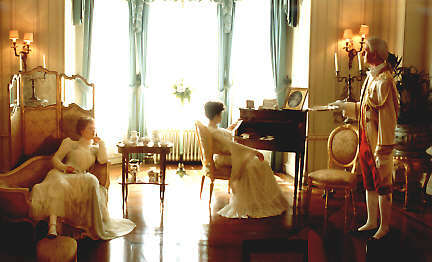 The rooms in the castle are maintained in their original condition, and are open to the puplic. 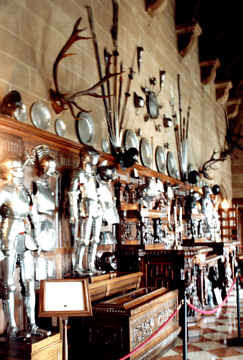 This photo shows a range of armour on display in the Great Hall. Many of the rooms include life-size wax figures, in period costume, like those in the Boudoir shown at the right. 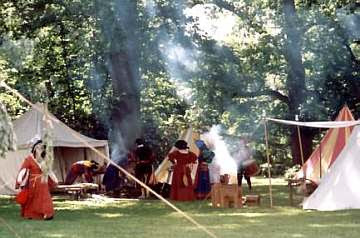 Some form of living history events takes place every day. This may be as simple as a falconry demonstration. On bank holidays, and during the Summer holiday period, more elaborate events are held. The apparent white haze in this photo is smoke from the cooking fires, rising through early morning mist. 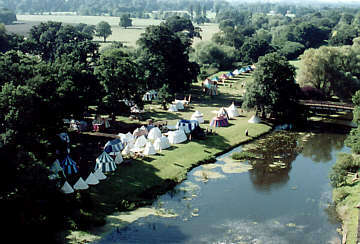 Some of the people taking part in the Medieval festivals camp in a tented village on the island in the Avon. This is a view of the island and the tented village, taken from Caesar's Tower. The bridge which joins the island to the castle is visible at the right of the picture. At the far end of the island, beyond the bridge, you can see the jousting field, where the jousting tournament takes place. 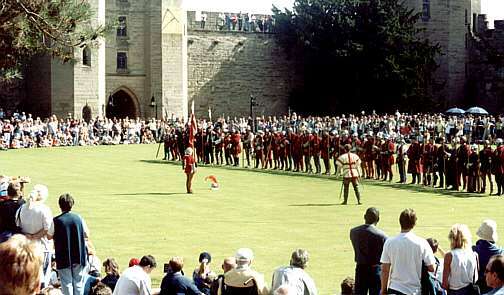 The Earl's soldiers provide a demonstration of drill for vistors. 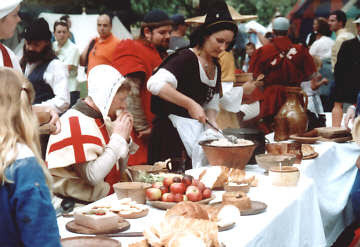 In the Medieval village, warm meals are prepared for the Earl's hungry soldiers. Other activities at the Medieval Festivals include archery, and exhibits of Medieval tradesmen, who explain their crafts to visitors. 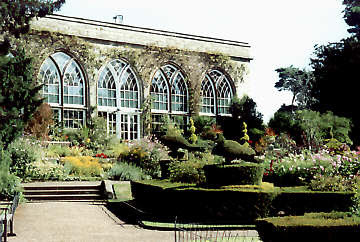 The castle has a formal garden, backed by a conservatory. 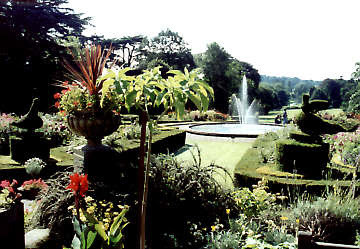 The conservatory houses some huge tropical plants, and the Warwick Vase. There is a very fine view from the conservatory, looking down through the garden, and right along the Avon valley. A visit to Warwick Castle is not complete without a visit to St Mary's Church, about 5 minutes walk from the castle. 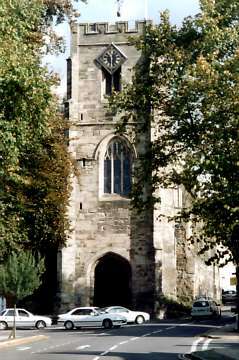 The development of St Mary's Church closely paralled the development of the castle, and the church is the resting place of many of the Earls of Warwick. There was a church of sorts on this spot in Saxon times. After the Norman invasion, when the first Norman earl of Warwick, Henry de Newburgh (1088-1119), was building the first motte and bailey castle on the castle site, he also established a Norman church here at St Mary's. The major stoneworks at the castle - Caesar's Tower and the Barbican were built in the 14th Century by Thomas de Beauchamp (1329-1369), who was also responsible for the Gothic stone construction of St Mary's. 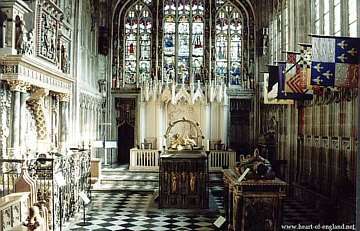 His own tomb lies here in the centre of the chancel (shown left). The most impressive feature of St Mary's is the Beauchamp Chapel, shown left, built by the grandson of Thomas, Richard de Beauchamp (1401-1439). Richard's tomb is at the centre of this chapel. Also in this chapel are the tombs of Robert Dudley (of Kenilworth Castle and companion of Elizabeth I) and his second wife. 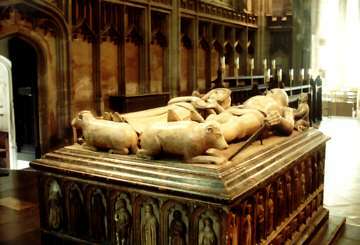 At the extreme left is the tomb of Robert Dudley, in the centre the tomb of Richard Beauchamp, and at the right the tomb of Ambrose Dudley. 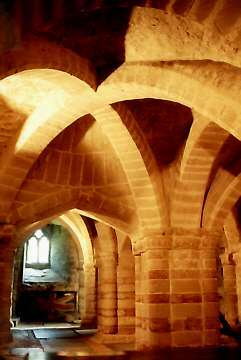 This photo shows the vaulted roof of the Norman crypt. Just off the side of the crypt are two vaults which contain the tombs of several more of the Earls of Warwick (the Greville family). 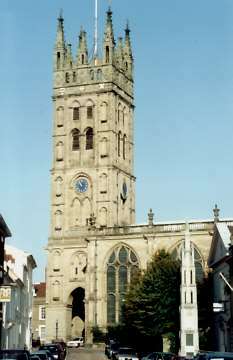 The tower of St Mary's is open to visitors. The viewing platform here, 174', is higher than Caesar's Tower (147'), and has good views over the town and countryside. 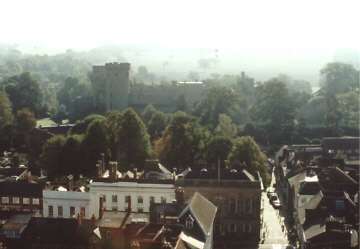 This picture was taken on a hazy morning, looking over the town of Warwick, towards the castle, with the countryside beyond. The road at the right, running towards the castle is Northgate Street/Castle Street. And this is St Mary's as seen from the castle. There are buildings all around the church itself, which prevent you from seeing the building at close quarters, so this is the best view you can get of the church. This picture shows the approach into Warwick from Stratford. 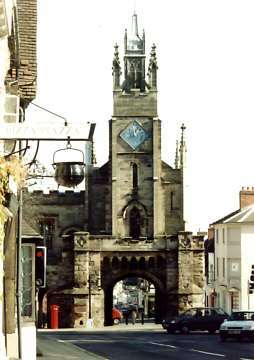 The building that looks like a church was originally the West gate into the town. A chapel was built over the West gate, around 1380. The road now goes round the gate, rather than through it. This is the view of Westgate from the other side. These buildings were the meeting place for the Warwick guilds. In 1571 Robert Dudley acquired the buildings for use as a retirement home for soldiers, and they became known as Lord Leycester's Hospital. The buildings have been used for this purpose ever since. The buildings are open to visitors. 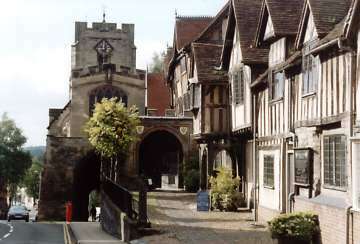 And at the far end of the same High Street is the East gate out of Warwick, also with a chapel built over the gate.